Nicholas Hall’s OTC DASHBOARD is an innovative web app designed to keep busy consumer healthcare executives connected with the latest industry trends, ultimately aiding daily business decisions. New in 2017, OTC DASHBOARD is now also available on Android and iOS devices! "OTC DASHBOARD is our secret weapon. It is constructed to provide a bird’s eye view of the market, yet with functionality to quickly swoop down on the specifics"
"OTC DASHBOARD is a very useful service that helps keep HRA Pharma regularly updated on breaking news and events from the world of consumer healthcare"
"As a Norwegian pharmaceutical company ready to grow in Nordic markets, Weifa has benefited greatly from OTC DASHBOARD, and the tool is used on a daily basis"
"In an emerging OTC market like India, our real need is for reliable data, insights and inspiration. 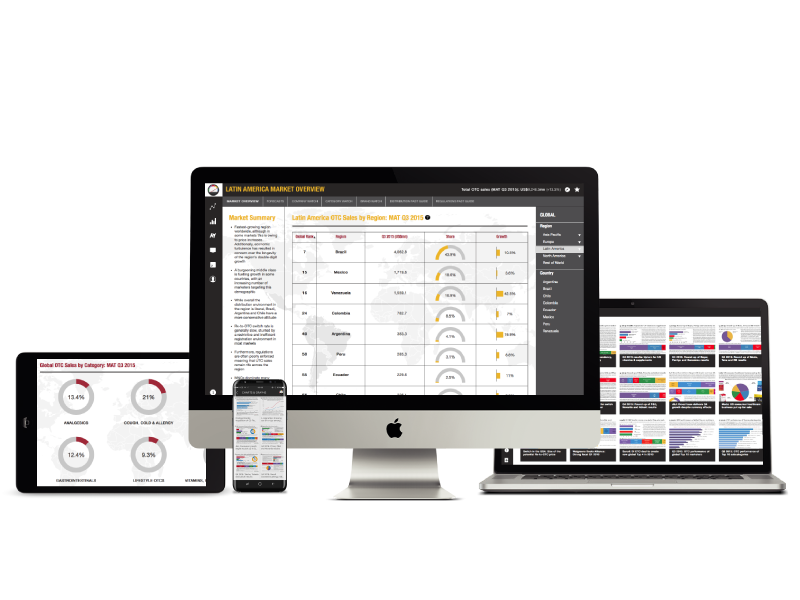 OTC DASHBOARD is the one-stop answer to this major challenge"
"An outstanding offering. Since 1990, we have come a long way in understanding the world of consumer healthcare thanks to the efforts of the Nicholas Hall team"
With topline coverage powered by Nicholas Hall’s DB6 Global OTC Database for over 60 countries, OTC DASHBOARD is a comprehensive yet accessible source of strategic sales data, designed for use on desktop, laptop and tablet. Content is updated on a quarterly basis for the leading OTC markets, supported by a series of infographics (weekly), ad profiles (weekly) and news reporting (daily) to offer clients a constant flow of key insights and analysis.